The San Francisco Bay Area Council offers the definitive character and leadership development program delivered through hands-on, high adventure, outdoor experiences that families and youth cannot find anywhere else. Our Council offers programs that challenge youth, while providing a safe and secure environment for them to learn. To assure program support for our participants and volunteers, the Council provides numerous camping programs, activities and a trained professional staff; it maintains several well used properties along with a suite of insurances. Our members use and benefit from all these things. Historically the Council has absorbed a very large portion of the costs related to these annual operations. During the last several years, costs have increased while revenues and incomes have shrunk. The Council remains committed to providing the best possible camping and outdoor activities, properly maintained and equipped properties, and insurances for its members and volunteers. 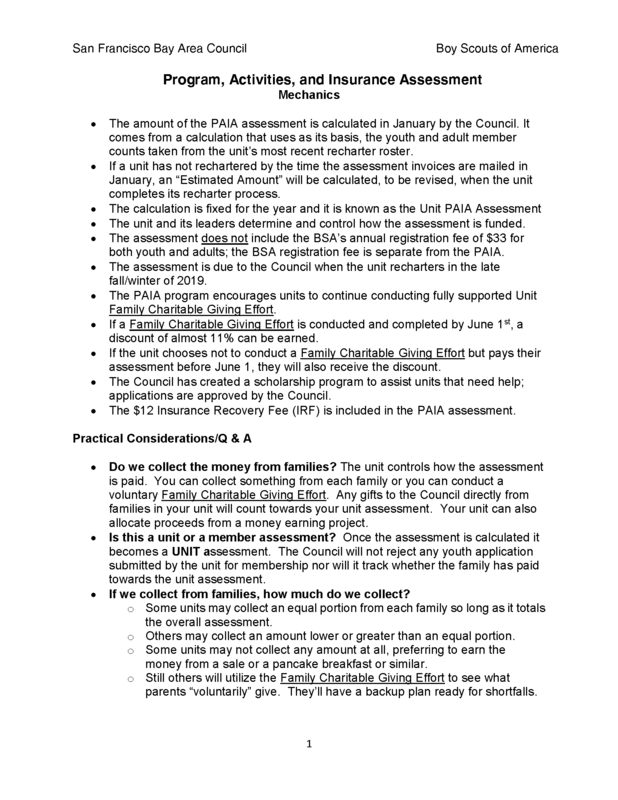 To continue doing so, in September of 2018 the Executive Board approved an annual Unit Assessment Program to be known as the Program, Activities and Insurance Assessment program (PAIA). 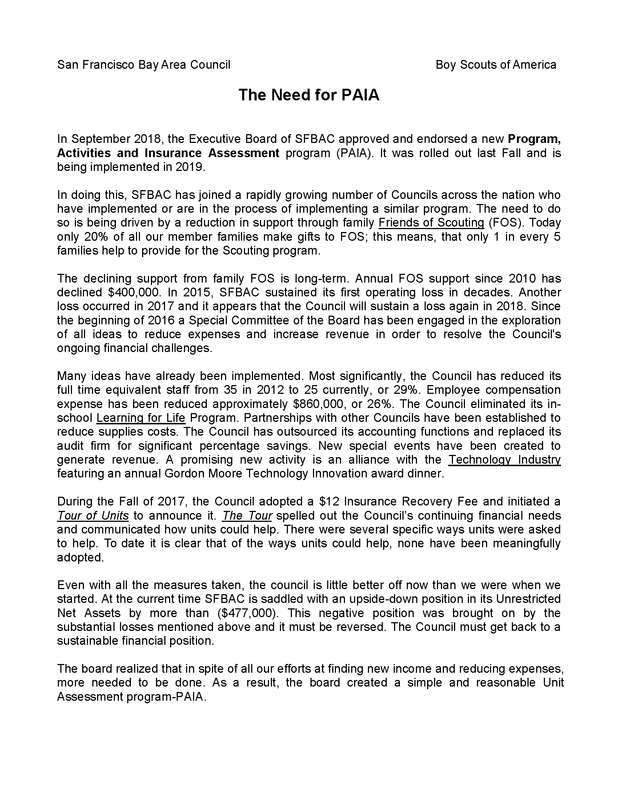 To introduce the details of the PAIA numerous information sessions and calls were held last year among unit representatives. 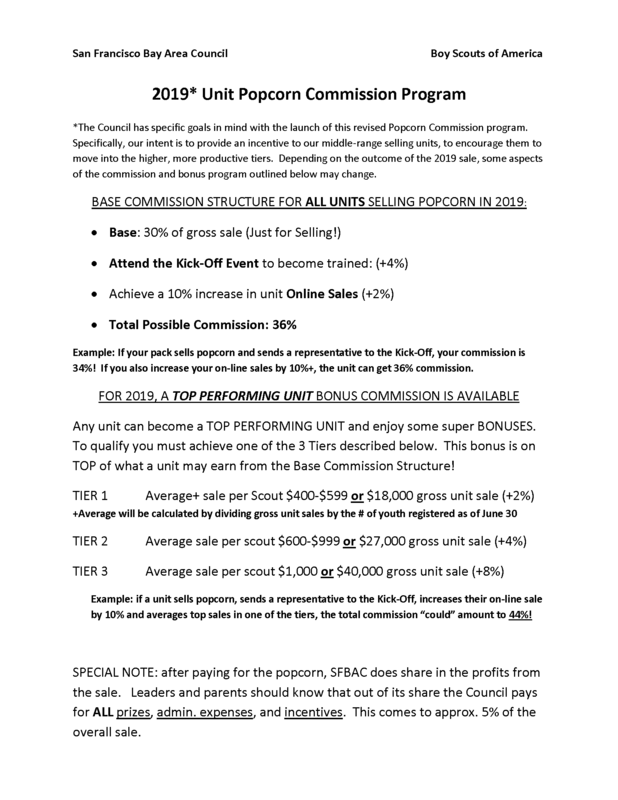 During those sessions we announced that we would be forwarding invoices to units during the month of January. Your personalized invoice is enclosed along with several other items. We ask that you take a moment to carefully review the information and reach out directly to your District Executive if you have any questions. On the back of this letter is a brief summary description of each item in this package. Thank you for your support of the San Francisco Bay Area Council as we work to provide a safe and secure program for almost 10,000 youth served.